Esri has relationships with over 1,800 partners globally that provide customer-focused geoenabled solutions. These partners have extensive experience providing GIS solutions and services across our core industries. Partner-provided solutions and services range from custom-built applications to complete system ArcGIS implementations. 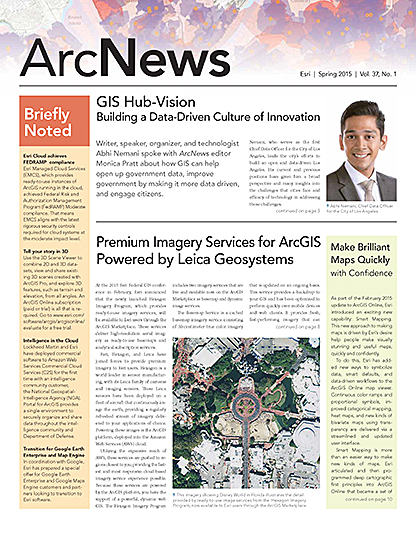 In this issue, Esri recognizes three partners that participated in the 2014 Esri User Conference (Esri UC) and have exhibited practical yet innovative application of ArcGIS’s latest features, taking geographic visualization and analysis to a higher level. For a complete list and description of our partners and their offerings, visit the Esri website. SmarterBetterCities provides a smart zoning tool that allows users to simplify the numeric and regulatory complexities. Decision making is easy after urban scenarios are visualized in 3D. The SmartZoning Plus app and 3D Libraries are built on Esri CityEngine and ArcGIS Online. This app supports a geodesign workflow. The SmarterBetterCities CloudCities 3D platform allows users to easily share 3D content on website blogs, social media, and mobile devices. Receiving feedback has never been easier or more dynamic. FireWhat Inc. is an emergency services GIS technology company that maps emergency incidents and tracks assets in and out of the field. Its near real-time detailed fire information data feeds have up-to-the-minute intel and can be migrated into any data management system or information product. FireWhat fire applications speed emergency response through the use of ArcGIS Online, Collector for ArcGIS, and custom applications. AmigoCloud, a mobile GIS solution provider, enables Esri users to collect, edit, visualize, and share geodatasets online and offline. Its solutions, which integrate seamlessly with ArcGIS Online, ArcGIS for Desktop, and ArcGIS for Server, support more than 60 geospatial file formats. These solutions can be used from any smartphone or tablet for collecting all types of geodata (points, lines, polygons) and sharing it in real time with members of an organization using the AmigoCloud Mobile GIS full permission setting.